As marketers we spend lots of time crafting the perfect landing page for our own promotions and for our clients’ promotions as well. How often have you found yourself tweaking CTAs to fine tune the message or even creating multiple landing pages with the same layout, but a different call-to-action? With Logic Hop you can easily craft dynamic CTAs and display the perfect message to every visitor. No more creating landing pages for each ad variation or social media post… Not only does this make your workload easier, it also makes your ads more efficient and reduces your bounce rate. You save time and money. Oh yeah, you can also increase conversions by 200% or more! You had me at increased conversions. In this tutorial we’ll take a look at how to create dynamic CTAs and automate your message. Fair warning, this is gonna take about ten minutes. No, really, with Logic Hop it’s that easy. We’ll start with a simple landing page for a fictitious eBook template with a static call-to-action. Nothing too fancy, but this is a solid CTA we can use as our default call-to-action. By default we mean this is a CTA we can show to anyone visiting the site. We’ll use this when we don’t have a specific visitor that we’re targeting. Our fictitious product is perfect for design, art, fashion and music and we’re going to promote it using pay-per-click ads, display ads and on social media. So in order to personalize our landing we’ll need a way to identify potential customers with those interests. We going to do this with UTM codes. You’re probably already familiar with UTM codes and using them with your ads, if not here’s a quick overview. A UTM code is a simple code that you can attach to a custom URL in order to track a source, medium, and campaign name. This enables Google Analytics to tell you where searchers came from as well as what campaign directed them to you. Read more about UTM codes from Neil Patel. You can “build” UTM codes by hand. This simply means you manually type the parameters at the end of your URL. Can can also use one of many free campaign URL builders like this one from Google to help add UTM codes to your URLs. If we’re writing a social media post targeting designers, we could use the URL shown above and add it to our Tweet. This would let our site know anyone who clicked the link was interested in design eBook templates. For our PPC and display ads we’d use the URL with the corresponding UTM code for each ad variation. The following example would let our site know that anyone who clicked the ad was interested in fashion eBook templates. Now that we have our URLs we can build out our personalization. Logic Hop uses conditions to determine which content to display. Did the user click on a link with utm_term=designer? Think about the condition we created – It’s really quite simple… Logic Hop will look to see if the URL contains the UTM code utm_term. If utm_term has the value design, art, fashion or music our condition is met and considered true. If it’s not met, the condition is considered false. Logic Hop can use a condition’s state, if it’s true or false, to perform an action such as displaying content. There are a number of ways we can put our condition to use, but the easiest is with a Logic Block. Logic Blocks consist of conditional content areas which are displayed based on the state of one or more conditions. Flyleaf is the best template to promote eBooks. 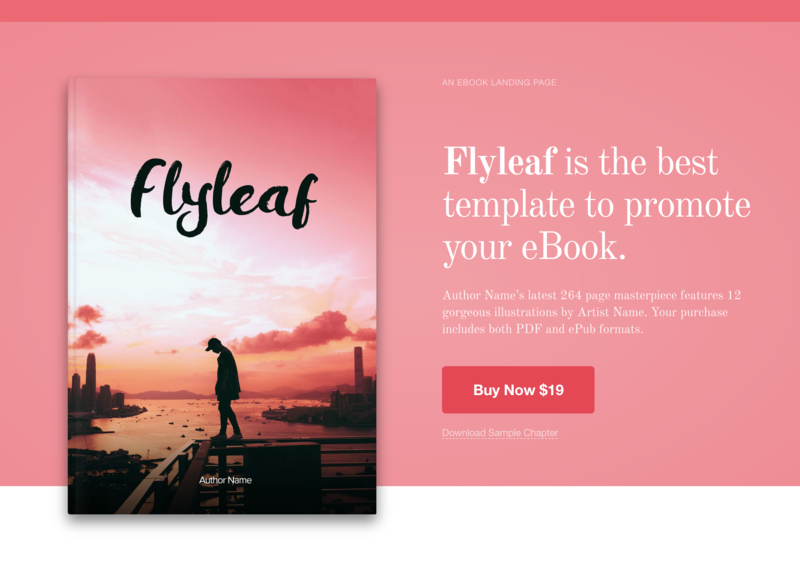 Flyleaf is the best template to promote your eBook. With our Logic Block created all that’s left to do is add it to our landing page. Logic Blocks use WordPress Shortcodes so you can simply copy and paste it anywhere your page. The great thing about shortcodes is that they’ll work with any WordPress editor, including Gutenberg. Now that everything is in place, let’s take a look at what’s happening. Flyleaf is the best template to promote design eBooks. Flyleaf is the best template to promote art eBooks. Flyleaf is the best template to promote fashion eBooks. Flyleaf is the best template to promote music eBooks. To change the text we used a Data Logic Tag to automatically grab the value of the UTM code and display it in our call-to-action. What happens if the visitor comes with a different utm_term like skateboarder? Since skateboarder is not one of the values in our condition Is In List the condition is not met, and skateboarder is never displayed. Now what if the user navigates to another page and comes back to the landing page? Great question! The URL will no longer have the UTM code, will they see the default message and be confused? Nope! 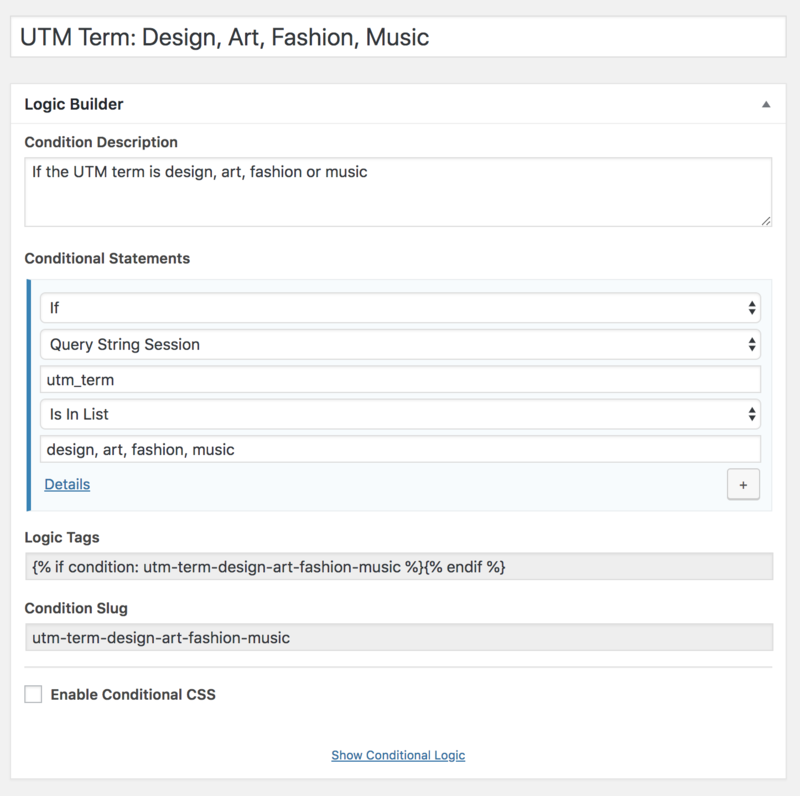 We’re using the Logic Hop Query String Session and QueryStore options so the utm_term value is stored for the visitor’s entire session and they’ll always see the right message. You want to display multiple values? Yes, you can! Your pages are cached? Logic Hop works with caching! You want to combine multiple conditions? Yup, you can do that too! With Logic Hop you can personalize almost any element on your site – Headlines, copy, images, widgets and even your CSS. Logic Hop also supports goals and can integrate with WooCommerce, Facebook Pixel, Google analytics and more. In this tutorial we’re just dipping our toe in the deep water that is personalization. In fact, Logic Hop is so powerful, that sometimes it’s a little daunting. What can you do? Everything! OMG how do I do that? Easy… Start by taking a look at our documentation and tutorials. Want to get started super fast? Don’t worry, we make it easy with ready-made personalizations called Recipes. In fact, you can add Logic Hop Recipes and literally be personalizing in minutes. Have questions or custom needs? We’re here to help – Just let us know or book a time with us and we’ll work out exactly what you need. Start personalizing today – Get your free 14-day Logic Hop trial now!